I wonder if you have ever been hungry – really, really, really hungry – so starved of sustenance that you would do anything for a crust of bread? I wonder if you have ever experienced agonising pangs of dry, parched thirst – thirst, so raging – it caused your dehydrated body to cry out in crazed longing? Over a sixth of humanity feel the ravages of physical hunger and craving for water. Many more hit pillows or pavement with a deep emptiness in their belly and bowls. However shocking such statistics – more horrific is the world’s spiritual hunger. However scandalous the malnourished hordes of humanity are.. spiritual need is an even greater lack. Acute, bodily needs are almost trifling compared with humanity’s deep spiritual want, and yet the deep-seated spiritual need is less discernible in today’s masked culture. Man’s intense, spiritual dearth is often hidden, disguised or camouflaged.. hidden disguised or camouflaged beneath a self-erected, protective exterior. Can you argue that God is not good, or gracious to allow such physical deficiency? No, for God makes his sun to rise on the evil and the good, He sends rain on the just and the unjust. Matt.5:45. It is man’s sins of greed and disinterest that permits scarcity and want in the world. It is Satan’s ploy to infect the world and cause distress of nations and pain to man. Though very real, the physical need of man is a parable of the grotesque paucity.. an allegory lurking behind closed church doors and spiritual slums of the globe. Can you argue that God is not good, or gracious to allow such spiritual deficiency? No – for had ye believed Moses, ye would have believed Me, said Jesus, for he wrote of Me. John 5:46. God spreads His table with great abundance – even in the presence of our enemies, and Mary sang, He fills the hungry with good things – pressed down and spilling over. 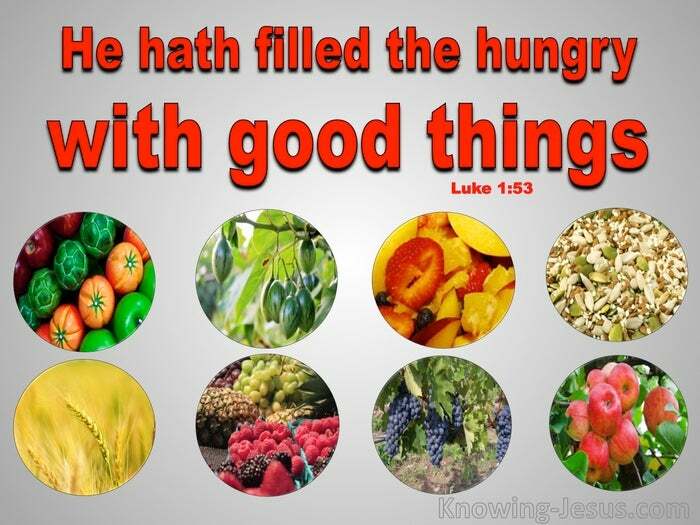 For whosoever hath, (hunger for the Lord) to him shall be given, and he shall have more abundance: but whosoever hath not, (spiritual hunger) from him shall be taken away even what he hath. Matt.13:12 – and the rich he hath sent empty away! Jesus told us that we would have the poor with us always. Jesus told us to feed the hungry, and Paul reminded us, I know both how to be abased, and I know how to abound. 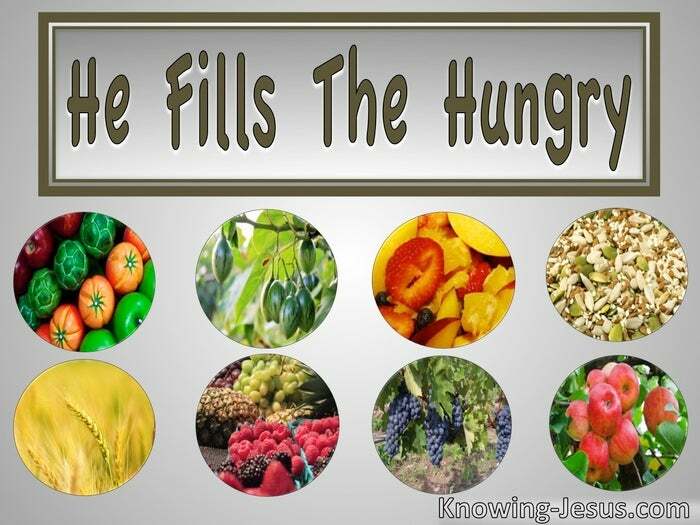 Everywhere and in all things I am instructed both to be full and to be hungry, both to abound and to suffer need.” Phil.4:12 Whatever our station in the physical realm, whether ‘full or hungry’ remember that your spiritual food is of the greatest importance to you. Our constant prayer to the Father should be – Keep me hungry for You.